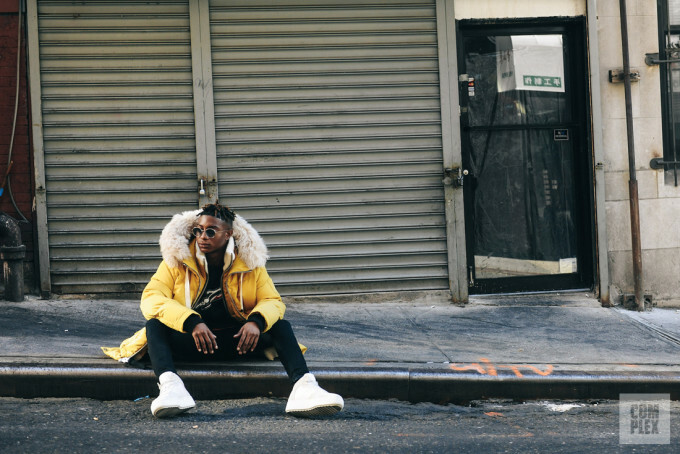 Shamari Maurice wears the Coach Toy Soldier Down Parka in Yellow, the Coach C210 High Top Sneaker in Chalk, and the Coach Gotham Backpack in Wild Beast Print Denim. Pants and glasses are his own. It only takes a few clicks to find out that Maurice rolls in a crew full of A-list Hollywood progeny—the current pop-culture pantheon if you will—that consists of Kendall and Kylie Jenner, Hailey Baldwin, Sofia Richie, and Bella Hadid, to name a few. Hollywood gossip site JustJaredJr.com keeps a running tally of the many times that he’s been seen in public or on social media with said squad of friends. While all of this tangential information is readily available, what’s vital to understanding the 20-year-old is knowing what he is, and what he isn’t. Maurice wears the Coach Rocket Ship Tee Shirt in Navy, the Coach Toy Soldier Down Parka in Yellow, the Coach C210 High Top Sneaker in Chalk, and the Coach Gotham Backpack in Wild Beast Print Denim. Jeans and glasses are his own. 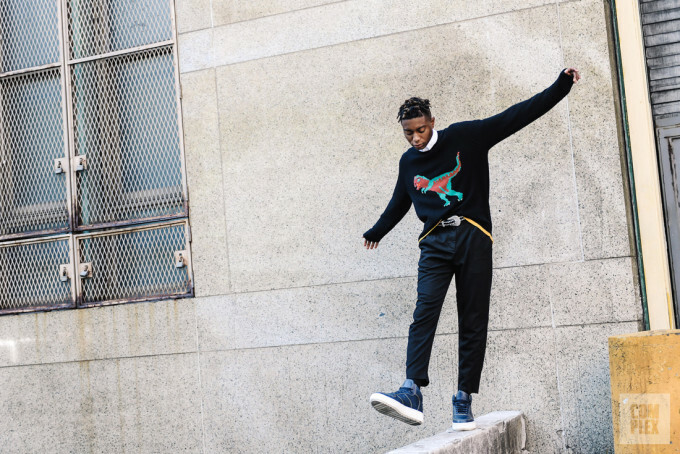 The self-proclaimed “epitome of an L.A. kid,” Maurice was raised between Los Angeles and the San Fernando Valley suburb of Van Nuys. He was born to middle class parents and has three brothers. Maurice had breaks as a child actor in shows like Ugly Betty and Modern Family. His brother Sheldon Smith, an actor as well, appeared in the movie Straight Outta Compton as Warren G.
Maurice wears the Coach Rexy Sweater in Black and the Coach Contrast Stitch C210 High Top Sneaker in Navy. Pants, shirt, and belt are his own. Distancing himself from the star power of his friends and finding his own creative lane is of the utmost importance to Maurice. This is why New York, as a backdrop to his one-man show, is such a crucial setting. Leaving L.A., albeit in month-long spurts here and there, has been important for Maurice. “My first impression of New York was ‘Woah, you’re not in L.A. anymore. Get over it,’” says Maurice. “Each time I come back to New York, I just think about perfecting my work ethic.” With the new city come new lessons that are helping Maurice move towards his goals, as varied as they might be. In person, he comes across as an eager future multi-hyphenate. His wide-eyed ambitions are too big to be focused on a single target. Currently, he’s pursuing modeling and styling simultaneously, continuing to mine the acting field, and taking singing lessons. 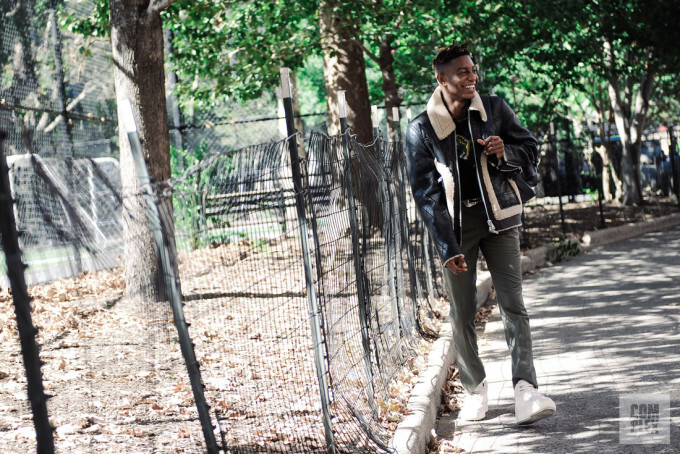 He speaks of his aspirations to create his own app in the tech world, star in a Broadway play, and build "the Shamari Maurice brand.” He’s currently developing a luxury collaboration with an unnamed French bag maker. His ultimate goal, though, is to grace the cover of Forbes Magazine. Maurice’s path isn’t one that’s been blazed by wealthy or famous parents, so for now, he’s tracking every potential route, in hopes that one creative pursuit will lead him to that all important cover. 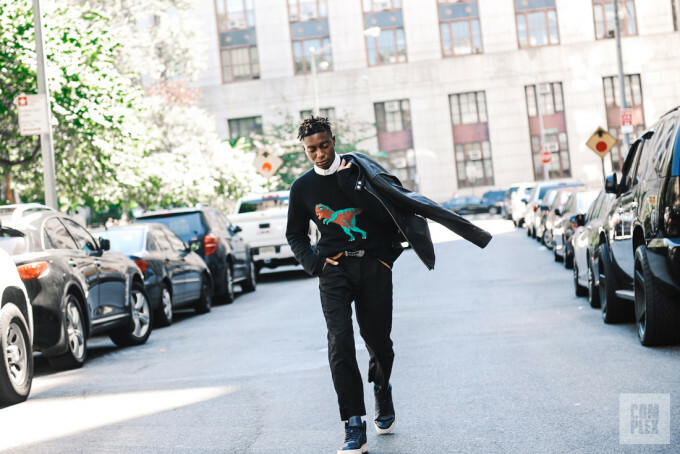 Maurice wears the Coach Washed Leather Racer Jacket in Black, the Coach Rexy Sweater in Black, and the Coach Contrast Stitch C210 High Top Sneaker in Navy. Pants, shirt, and belt are his own. So far, modeling is one area that has already started to pop off for Maurice. For the Fall/Winter 2016 New York Fashion Week, Maurice opened the runway show for VFILES, clad in an oversized white puffer coat, matching shorts, and wheat-colored classic construction Timberlands. “That was a fashion moment that I never thought in a million years that I’d be able to experience,” said Maurice. “I’m close with Rox [Brown, stylist at VFILES], and I’d reached out because I wanted to help with the show. But they suggested that I should actually be in the show. I remember Rox saying ‘You’re lit. You’re gonna open the show.’ I was so scared. Everyone was so tall! My heart was beating fast the entire time down the runway.” Maurice posted a shot of his catwalk debut on his Instagram account. To date, the image has received 10,000 likes. 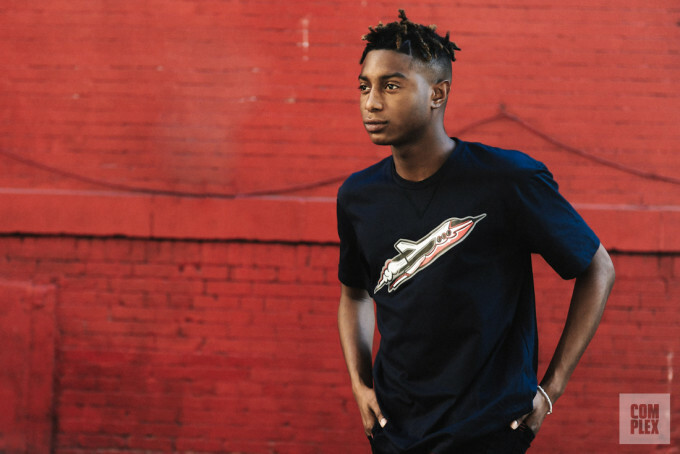 Maurice wears the Coach Rocket Ship Tee Shirt in Navy. Pants are his own. 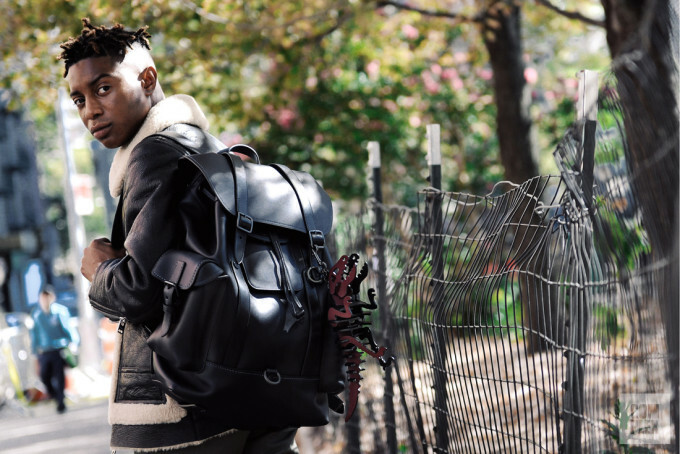 Maurice wears the Coach Shearling Stinger Jacket in Black Crackle, the Coach Gotham Backpack in Navy Glovetanned Leather and Black Copper, and the Coach Large Rexy Charm in Black/Burgundy. Pants are his own. 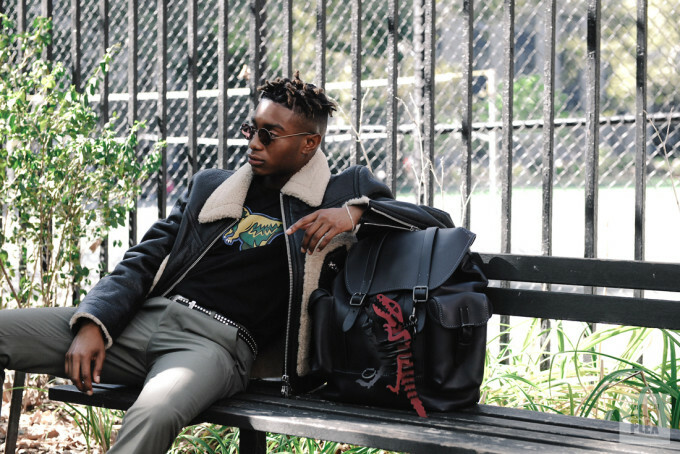 Maurice wears the Coach Shearling Stinger Jacket in Black Crackle, the Coach Rexy Tee Shirt in Black, the Coach Gotham Backpack in Navy Glovetanned Leather and Black Copper, and the Coach Large Rexy Charm in Black/Burgundy. Pants are his own. Maurice wears the Coach Shearling Stinger Jacket in Black Crackle, the Coach rexy Tee Shirt in black, the Coach C210 High Top Sneakers in Chalk, the Coach Gotham Backpack in black copper and navy glovetanned leather, and the Coach large rexy charm in black/burgundy. Pants are his own.